Well, you shouldn’t be. While it is true that full frame sensors are better at high ISO imaging, you can get decent images with cropped sensors if you can get some control over your noise reduction. You can learn a little about noise in this article. The first step is to shoot in RAW so you can manage your own noise reduction and sharpening, which work hand-in-hand. As you increase your noise reduction your image will need some extra sharpening. While shooting in JPEG lets the camera take care of it all for you, you can get much better results if you do it yourself. 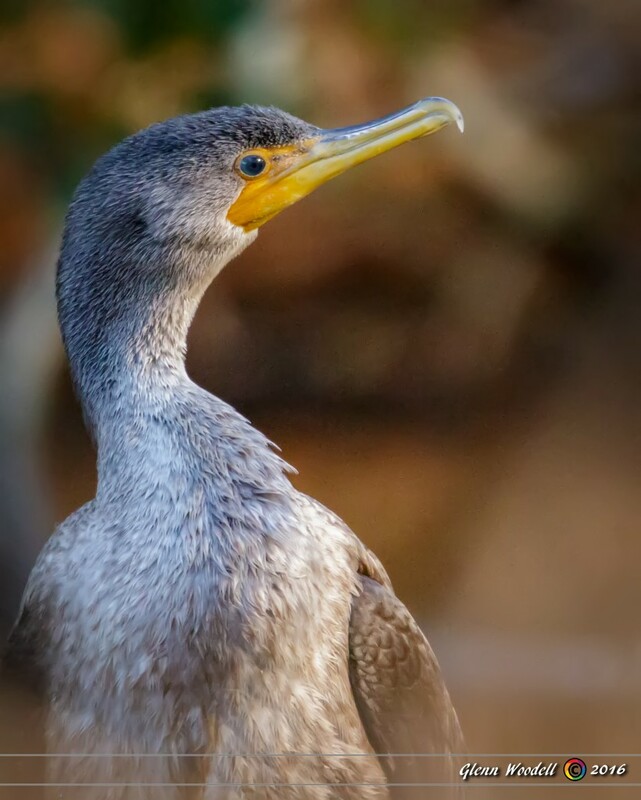 Consider this image of a cormorant made with a cropped sensor camera. I was shooting an f4 lens and using a 2X teleconverter, so my fastest aperture was f8 which is pretty slow compared to most lenses. I had been using the built in noise reduction and sharpening found in the Adobe Camera RAW editor but I have since switched to Noiseware which gives me much better performance. 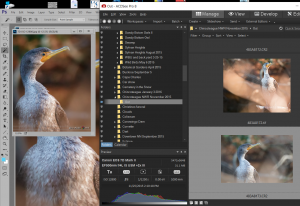 Screen shot of image during processing, showing EXIF data. Click for large image. 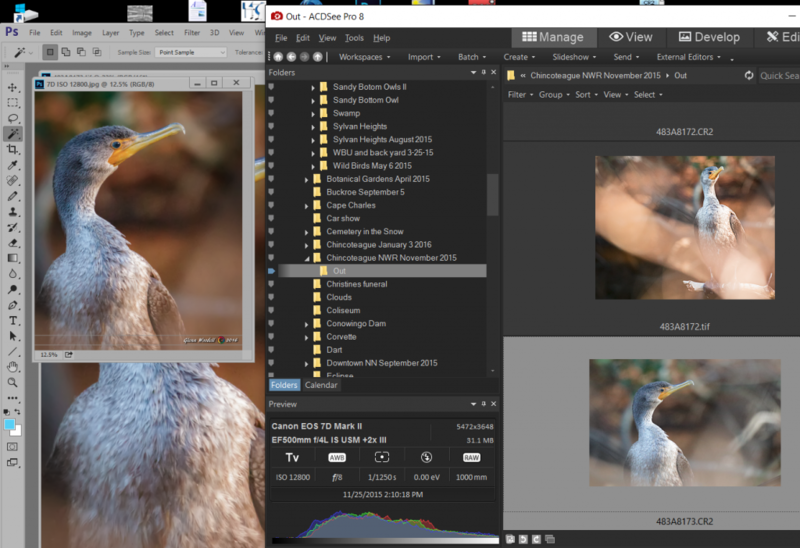 You can see in the data listed at the bottom that I was shooting at a whopping 12800 ISO! But after proper noise reduction and sharpening I ended up with a very satisfactory image. While I prefer to shoot at lower ISO values, I don’t worry too much about it. I know I’ll have to lose a little bit of detail in the end but I can still come out with a nice image after using the proper tools. Image of cormorant after noise reduction and sharpening. Click for large image. Thank you Glenn for the link to noise reduction. I read it. I did see that you shot at a high ISO and very successful at improving it on the Cormorant.. I was shooting jpeg in Muscarelle Museum of Art, my camera settings for school project and that photo of you in the gallery had noise in it. I used lightroom to tone down the noise, but it was still grainy.. I usually always shoot raw and most of the time ISO 100 my preference for landscapes, portraits, etc but playing around with my new camera to test it out. You can still do some processing on a JPG image but beware that you will be compressing twice (once you save it) so compression artifacts will increase. In those cases you want to make sure you don’t underexpose because the JPG compression produces more “jpeggies” in the darkest areas. A third party noise reduction program, like Noiseware, will do a remarkable job of reducing noise, likely to an acceptable level.